Julia C. Lin , ed/tr. An Anthology. Armonk, NY: M. E. Sharpe, 2009. 272 pp. Twentieth-Century Chinese Women’s Poetry: An Anthology, edited and translated by Julia C. Lin, is a much-needed collection of modern Chinese women’s poetry in translation for readers who are interested in modern Chinese poetry and women’s verse in particular. It is a welcome addition to the resources available for the study of modern Chinese poetry, such as Kai-yu Hsu’s Twentieth Century Chinese Poetry, Michelle Yeh’s Anthology of Modern Chinese Poetry, Dominic Cheung’s The Isle Full of Noises, Edward Morin’s The Red Azalea, Wai-lim Yip’s Lyrics from Shelters, and Julia Lin’s Women of the Red Plain, just to name a few. What makes this anthology important is that it brings together for the first time the works of twentieth-century women poets from both sides of the Taiwan Strait, works that would have otherwise been scattered in various anthologies. As such, it brings to center-stage “this much-neglected body of work” (xiii), as Julia Lin puts it in the preface. 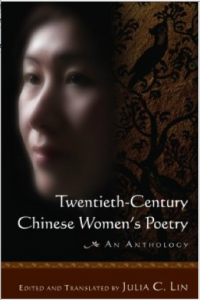 The anthology includes selections from the works of an extraordinary range and diversity of women poets, from the pioneering Bing Xin and Lin Huiyin, who were writing at the birth of New Poetry in the early 1920s, to the experimental poets from both Mainland China and Taiwan in the 1980s and 1990s who were writing with an increasing feminist consciousness. Two hundred and forty-five representative poems of sixteen women poets from Mainland China and twenty-four from Taiwan are collected here. The anthology is comprised of two parts. The first includes selected poems by Mainland Chinese poets and the second contains poems by writers from Taiwan. The poets are organized chronologically according to each author’s date of birth. A brief biographical headnote introduces each poet, discusses her life and works and, in many cases, highlights her principle achievements or contributions to poetry. In the extensive and very informative introduction, Julia Lin and Nicholas Kaldis trace the development of modern Chinese women’s poetry from the beginning to the end of the twentieth century, with a special focus on the exploration of the poetic expressions of women’s perspective. Lin and Kaldis argue that the traditional feminine mode dominates the works of modern Chinese women poets from the early Republican period through to the 1980s. Therefore, regardless of the radically different socio-political conditions under which they write, women poets from both Mainland China and Taiwan do not demonstrate in their writing a keen “feminist consciousness,” even though continuous efforts have been made by poets from both places to “expand and test the limits of poetry in the traditional ‘feminine’ mode” (xxxv). Nonetheless, much of the discussion in the introduction is devoted to the works of those poets who are not bound by the traditional feminine mode. Chen Jingrong and Zheng Min, who were very active in 1930s and 1940s China, are highlighted for their ability to write not only “introspective lyrics traditionally associated with feminine writing,” but also “realist poems on urban alienation and philosophical poems” that are most commonly considered “masculine” themes (xxxiv). Zhang Xianghua, a ‘poet from Taiwan who claims to be “a poet first and a female poet second” because she believes that “creative writing itself ought to be a boundless experiment of life, regardless of gender” (xlii), is considered “exemplary of a transitional moment in the development of Chinese women’s poetry-from the ‘feminine’ tradition toward a ‘feminist poetics” (xli). Lin and Kaldis point out that Zhang’s wish not to be labeled a “female poet” resonates with that of mainland women fiction writers, a point noted by Lydia Liu. Liu argues that female writers take issue with the notion of “women writer” because they believe such designation will put them into a “subcategory in the mainstream (male) literature,” so that their objection to this title indicates their “fight against the condescension of their male colleagues and their own trivialization” (xlii). Shu Ting, the most prominent female poet to emerge in the post-Mao era, is also considered by Lin and Kaldis a poet whose diverse body of work operates on “the border between the traditional feminine mode and a feminist poetics” (l). It is not until the 1980s and 1990s, Lin and Kaldis argue, that a new generation of poets emerges from both China and Taiwan to write poems with a more consciously feminist agenda. These poets focus much of their attention on the “exploration and discovery of self” and the “quest for a gender identity” and demonstrate in their works “a feminist consciousness that is all but absent in the work of their forerunners” (l-li). Bearing in mind that women’s writing, whether explicitly feminist or not, reflects and responds to “the ideologies and practices of particular cultural formations” (xxiii), as the editor of the anthology, Lin makes conscious efforts to select, translate, and compile a collection of poems that express women poets’ particular experience and perspectives. Many of those included in the anthology are among the finest of modern Chinese women poets who have played a major part in the development of women’s verse in China and Taiwan. Their distinctive poetic voices are presented through a careful selection of poems that express their thoughts, concerns, opinions, and feelings, and often times address gender-specific topics and issues. Seven poems of Lin Huiyin, a representative poet of China’s first generation of women poets, are collected in the anthology. Writing primarily in the traditional feminine mode, Lin nevertheless expands “the range of themes and tones that women poets might adopt” (xxvii). Unlike her contemporary Bing Xin, who strives to “inspire readers with idealized visions,” Lin Huiyin insists more on revealing “the difficulties of actual experience” and expresses often in her poems a deep melancholy with “grotesque” imagery (xxix). In “Foul Mood,” for example, Lin compares the foul mood in sickness to “the cold northwest wind” that slowly blows “on piles of garbage in alleys and street corners at dusk.” It gets even worse when consolation is sought, as Lin writes, “I try to console myself with bits of moldy, rotted odds and ends / but after all is used up, I’m startled at the wreckage that is left, / and bit by bit raising yet more terrifying dust for somebody else” (6). Rong Zi, a leading poet of Taiwan, is noted in the introduction for her particular interests in exploring the life and experience of a modern woman artist who must confront the “plight of a professional woman in an industrial society” (xxxix). Six poems from her third book of poems, Verna Lisa Suite, are translated and collected in the anthology. The courage and determination of a woman artist is shown from such poignant lines as, “Confronting mass ‘captivity’ / ah death, death is to be celebrated! / – such is my Verna Lisa’s prayer / such courage in solitude such desperate determination” (109). in order not to walk into the wrong door. The translations of the poems are elegant. In the “Preface,” Lin points out that she hopes to “recreate in the second language the spirit of the original” so that she will not sacrifice the artistic merits of the poems for the purpose of achieving absolute translational fidelity (xiv). This approach is carried out throughout the anthology and the translations are executed with imagination and admirable artistic skill even as they maintain accuracy and faithfulness. However, the entire anthology contains no Chinese texts. Even though the names of the poets are thoughtfully provided in both Wades-Giles and pinyin, it would have been helpful to some readers and researchers if the Chinese characters for each of the poets’ names were also included. The volume tends to emphasize poets of the post-Mao era, and although Lin’s intention in doing so is to avoid repetition and duplication (xiv, xxiv), an anthology that claims to span the twentieth century might appear to be more balanced if poets and their representative works of the pre-1949 era could have received more if not equal attention. There is no doubt that this is an outstanding anthology, and it makes an important contribution to our understanding and appreciation of twentieth-century Chinese women’s poetry. With its informative and well-written introduction and rich selection of poems, it can also serve as a welcome source and textbook for relevant courses on twentieth-century Chinese poetry in general or women’s poetry in particular .